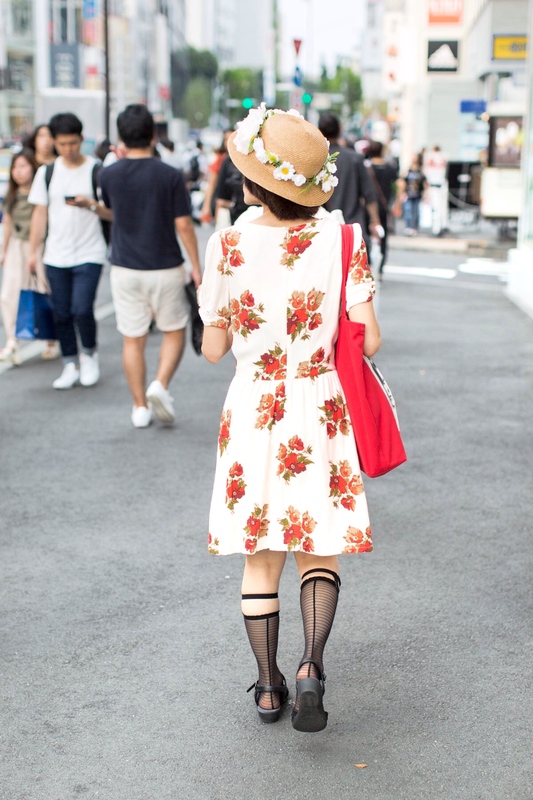 Yulia Lisitsa, streetstyle photographer and author of the PeonyMagazine, shoots interestingly dressed people on the Tokyo streets. In the magazine’s archives, we selected photographs that are somehow related to lingerie and to desire to add to the everyday outfits some boudoir elements such as unusual chokers, lace robes, transparent dresses, harnesses and satin underwear tops. A thin black choker and a transparent lace of the lingerie robe added to this outfit the notion of bliss and intimacy. If in Russia, such robes are often found in the “bride’s morning” photographs, then in Japan it fits perfectly into street-style with sneakers and loose torn jeans. The contrasts game in the outfit takes place not only in the field of black and white colors, but also on the field of combining sports and dynamics (sneakers) with the transparency and romanticism of the upper dress. This is one of the outfits that we like most for the moment. The original wide fishnet choker with delicate architectural lines gently and unobtrusively emphasizes the neck. Satin top decorated with lace looks good in ansamble with loose black jacket. Surprisingly, but slippers with a snake pattern, and checkered pants with transparent inserts just below the knees, and a bright bag fabric complemented the outfit into a single whole that you want to look at. Another interesting choker with a belt buckle. It’s worth taking a note. Let’s focus on the details now. Gartered socks is a thing that we practically did not see in Russia (except for our own outfits devoted to this subject of the wardrobe). So it’s more pleasant to see them in everyday life on the Tokyo streets. Sometimes all you need to make charismatic outfit is one small detail. Although in this case the detail is very big. This is a choker made of a rather thick twisted rope, with a long purple-blue tassel. Romantic-naive style in the outfit with ruffle socks, worn on white pantyhose and complemented with sandals in the form of fluffy toy rabbits. In the @peonymagazine instagram account, there are also many images with beautiful kimonos. What outfits or outfit details do you like?